Our Stock Screener App available for App Store and Play Store. 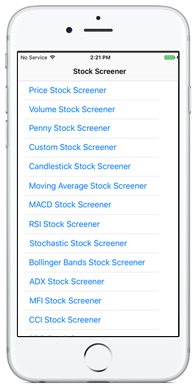 If you have an iPhone or an Android phone, you can install the stock screener app for free. The Stock scanner app to scan the US stock market based on technical analysis and stock chart patterns for stock trading. 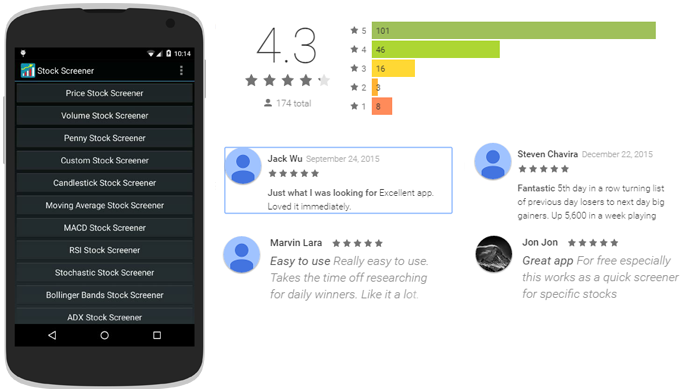 Thousands of traders already installed our app for android and the app has an average rating of 4.3 based on 1700 ratings. Here are some of the comments from our users. We just launched our stock screener app for iPhone recently. It works exactly the same as the android version, except the background color. There hasn't been any reviews yet. Check it out and be the first one to review our app.